Ranging from the tiny Patch-Nosed Salamander with adults less than 2 inches in size to the Chinese Giant salamander, the diverse family of creatures known as Salamandridae is one of the most threatened groups of vertebrates on the planet. Because of their extreme sensitivity to environmental factors, salamanders are being referred to as the “canary in the coal mine,” an early-warning system for ecological decline which will also impact other species, including humans. Salamanders are amphibians, living at least one stage of their life cycle in water. Some species spend their entire lives in headwater streams while others are born in temporary vernal pools, moving onto the forest-floor as they mature. Wherever they live, it is necessary for them to remain in moist environments, as this enables them to take in oxygen through their skin. Their permeable skin is what makes them particularly vulnerable to environmental disturbances, from chemical pollution to the thinning ozone layer and global climate change. Habitat loss, highway mortality, disease, acid rain, pesticides, and climate change are all factors in the decline of salamanders, even causing some to vanish without a trace in a single breeding season. Of the approximately 560 known species of salamanders, nearly 40% of them are classified as endangered. 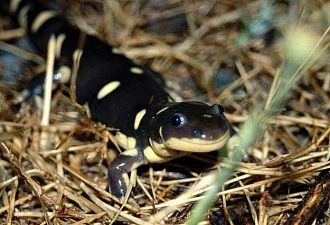 The decrease or disappearance of a salamander population is often the first sign of ecological problems in a previously healthy environment; problems that if ignored, will come to impact the entire ecosystem. Not only will a salamander die-out impact the species itself, the removal of a species from an ecosystem changes the system. A salamander’s primary diet is based on insects; they play an important role in the regulation of invertebrate communities and ecosystem processes on the forest-floor and in aquatic systems. An adult salamander will eat its weight in insects every two days. Remove salamanders from a system where they were previously found and the insect population will flourish causing an imbalance, and increasing insect borne disease and destruction. TFOT images of other endangered amphibians can be found here: ARKive – Images of Life on Earth. Other TFOT features have focused on the topic of environmental issues including “Rocket Science Wastewater,” a piece that tells about a new process of powering wastewater treatment plants, and “Rate of Ecoshift in a Period of Climate Change,” which describes how ecosystems must shift to keep pace with current climate changes. Lynda has a BS in Biochemistry with a Technical Writing minor from the University of Tennessee and she has a certification in Bioinformatics from John Hopkins. She works in a research laboratory and as a freelance science writer.